This is a market analysis site. It’s not limited to TA. mcgcapital’s post are consistently among the highest quality of anyone who posts here. Also, it amazes me how many posts there are this morning about the outcome of the Mueller report, when the only thing the public has been told is that the report has been completed. However, no one yet knows what the report says, other than a few people in the DOJ. This is an objective Elliott wave site which has always allowed a wide range of different approaches in the comments section. Must have missed it where we were told it’s exclusively for technical analysis. Markets really aren’t more than discounted cash flow mechanisms.. I’ve tried to explain this a lot here but some would rather carry on with false investment beliefs, so there’s not much more I can do. Not sure why you think age is relevant here. I was born in 1988 but know more than you. I’m more interested in quality than length of time.. it’s clear you don’t have the same level of financial education or depth of experience on your CV as me from your posts as you believe things that are easily disproved, which shows a lack of intelligence. we’re supposed to be keeping personal attacks to a minimum out of respect but you can’t help yourself. scott, your “appeal to authority” argument is a common type of fallacy, and is based on unsound logic. Passing the Series 7 only means that a person had a very basic understanding of the fundamentals of the markets at the time they took the test, and most importantly, it gives them the legal authority to make investment recommendations. It has zero correlation as to whether or not the person has even the slightest ability to analyze the markets and/ or make money in the markets. Everyone who takes the Series 7 knows that you only have to know the information contained in the test for as long as it takes to take the test. Once the test is over, then you can forget all of it, because you’ll never use any of it in the real world. mcg…would have to respectfully disagree. Had Mueller found proof that Trump colluded with Russia, that would an impeachable offense and perhaps setting up a constitutional crises…as to whether or not a sitting President can be impeached. While most legal scholars say he cannot be indicted, while in office, I don’t think that, that is settled law. and I could easily see the Democrats testing that issue. If nothing else, it could weaken Trump for several more weeks/months as the this law suit goes through the courts. Regardless of that issue, I don’t think the markets would react favorably if the SCOTUS were asked to rule on whether a sitting president can be indicted, as that could take weeks/months to resolve. As I mentioned below, Mueller/Rosenstein confirmed no further indictments, this puts Trump in a stronger position both politically and IMHO in negotiating with China…..potentially a negative development in the talks. Think in terms of additional tariffs…..not what Wall Street wants to hear. I don’t believe China will be happy with the news that has com3 out…so far. Yes, as aah stated we don’t know the findings of Mueller’s investigation but so far it looks encouraging for the Trump Administration. Exactly this.. it had/has the potential to be a negative shock but it’s not something that will provide a positive surprise. The market hasn’t been focusing on it given we’ve rallied 20% in 3 months. Political events are hard to price so the market usually gravitates towards the most likely outcome (I.e. nothing coming out of it) so that’s what’s in the price. Market always knew they would find nothing of consequence, just like most people already knew for the last 2 YEARS. 37 indictments is nothing of consequence? Not really? Depends on how much those indictments impacted you I guess. Anyways, if the market crashes it won’t be because of that. Not that we should care. 1. approx 24 of 37 are Russians that will never appear in court and Mueller has tried to block the attorneys for the Russians to produce evidence. So these indictments were for show, Muellerwanted to justify the ongoing investigation. I have made up nothing. 37 indictments. 7 guilty pleas. 0 acquittals. The confirmation bias posted by the MAGA-cult on this blog is amazing. No one knows what’s in the report, yet the cultists have immediately assumed that the report totally exonerates Trump and his crew. However, the report can just as easily totally condemn them all. Mueller could easily have decided to end his investigation early because his evidence against Trump is so damning, and represented such a national security risk that he wants to get the information to Congress immediately. The fact that there are no additional Mueller indictments is meaningless because he has farmed out so much to other US Attorneys Offices. The ending of the SCO investigation could easily be the beginning of Trumps’ worst nightmare. If they had anything solid on Trump they would of leaked it I mean there’s so much hate against the guy one can almost taste it. On the contrary, nothing has ever leaked from Mueller’s office in the entire 2 years of the investigation. Now that he has given his report to the DOJ, and if it’s a slam dunk in Trump’s favor, one has to wonder why that hasn’t been leaked, and why the AG didn’t release the report today, and why Trump hasn’t tweeted anything in more than 24 hours. The silence is deafening. Desperate nonsense aah. Dems keep moving the goal post as the swampy fiction is proven just that. The bulk of indictments were Russians and the rest worked for Clintons and Bush’s in the past. In fact most of the “crimes” occured WAY before Trump even knew he would run and completely unrelated to him. The big surprise will be now chasing the REAL criminals – Podestas, Steele, Clintons etc…. where all this frivolous fiction began. Gonna be a blast as we waste another couple hundred miliion. Huh? Mueller’s task was to investigate Russian criminal influence in the 2016 election, and whether or not Trump’s campaign colluded with the Russians in the process. Lo and behold, Mueller did indeed find at least 2 dozen Russians who were involved and he indicted them. On top of that, he also indicted 6 of Trump’s top aides, including his campaign manager, assistant campaign manger, personal attorney, and National Security Advisor. In fact, it’s been the most successful special investigation in US history. It has also led to Trump being named as an unindicted co-conspirator in a felony by the SDNY, with many more investigations/charges yet to come, which will no doubt include bank fraud, insurance fraud, money laundering, and tax evasion. Just imagine if Mueller had been completely silent for the past 2 years, held everything back, and then on Friday evening, announced 37 (!) indictments, including Trump’s lawyer, National Security Adviser, and campaign manager. The country would be in total shock, and the WH would be in total disarray. As I previously said, no matter what the report says, the ending of Mueller’s work marks the beginning of Trump’s worst nightmare. That’s the best that Trump can hope for. Asa – agree and disagree. Even had “collusion” been found itsnot impeachable. Thats ONE of the jokes of this whole fictional distraction. Myriad candidates have “colluded” with foreign entities throughout the decades. Nothing new. Still in Aruba…my take on yesterday’s trading were weakness throughout the day secondary to economic reports both in Europe and in the U.S. There are unconfirmed reports of Mueller not indicting any additional people that was viewed as strengthening Trump’s political position. IMHO, Trump now has the flexibility to take a hard line stance against China. Had Trump been weakened by the investigation, Trump might have cut the best deal he could and move on…..and that may happen but less likely. I think that might have been the cause of the ugly close. The drop happened BEFORE report was announced so someone knew? nah, the drop was just a coincidence like the trade war fiasco. Good thing i LOADED UP on those PUTS! I did announce this here didn’t I? I do believe i did. now i await the damage control from the report and if we get any additional info this weekend. You keep ignoring telegraphed game changing events while silly me, I will continue to lose my money betting without the advice of the EW gurus. Monday is a BIG day. Bigger than Friday. No, I am not predicting a deeper drop. 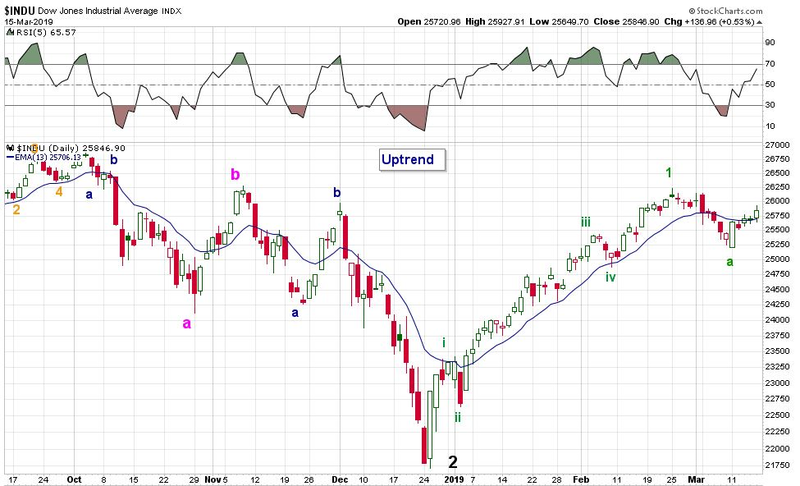 I just meant that in order for MY scenario, ala March 2018 to be revisited we would need two more consecutive down days before any attempted retrace. it always goes in threes or more. My timing on PUTS however caused me to lose all my PUTS expiring this Friday. I kept adding more and more and pushing it out KNOWING this sucker was due for a big drop. I do play with excitement. I do always try to catch the big turns before it happens. Not a typical and likely profitable way to play but it is my style and i have a knack for getting close to the turns. Home run on trade wars and hoping to surpass it this coming week. If Monday is an up day I will likely recoup all my bets on a break even basis or perhaps make a small amount. Any market drop from here will compound my winnings. Mueller “report” – again – big Nothingburger. 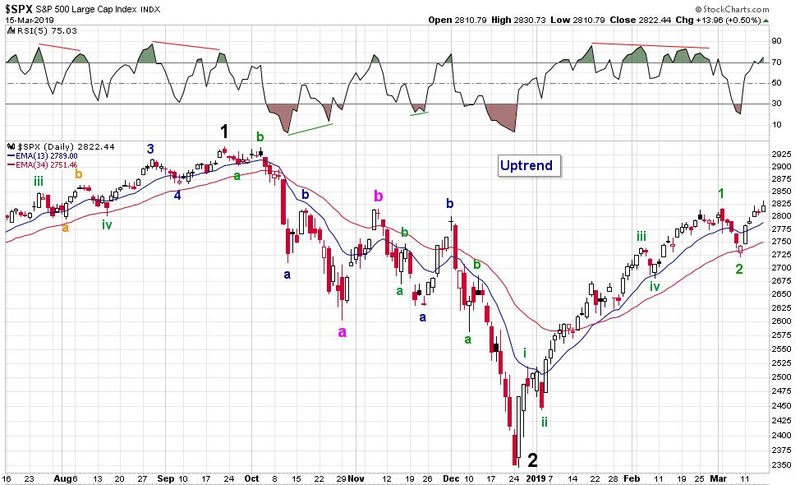 Market will rally on this little segment of uncertainty being cleared up. All the hysteria, two years of MSM preemptive “hoping”, all the panic and tens of millions of taxpayer dollars all based on a piece of fiction written by a DNC paid Russian author (ie hoax) for naut. So many were so sure this was the end all be all – and nothing. Lets move the goal post now and waste another two years and multi-more millions – maybe that’ll bring him down 🤪. I think most people didn’t seriously entertain this very transparent conspiracy born by the MSM/DNC. Market already knew this too of course. The only potential worry is what they will do next since their crappy plan A failed. Holly, when you rant and talk in circles WHO exactly are you referring to? Did no one else short the market this week but you? Did the entire media not tell us that the report was coming in the next few days? What possible reason to post daily on a site where you claim there is nothing of value here for you and you simply come to rant and tell others they are wrong. Just curious of your motives. I assume it’s just to tick people off using a fake account. Is everyone still pretending this Gary is no longer Holly? I bet you’re a hoot at parties. Not to worry……gary/holly is about to see the opposite of their expectations happen. If there is any truth to their statements…..they are about to experience a serious drawdown. The Special Counsel’s 2 year investigation is over and now finished. Attorney General Bill Barr now has the report. Perhaps there was a “leak” that found its way into today’s market? 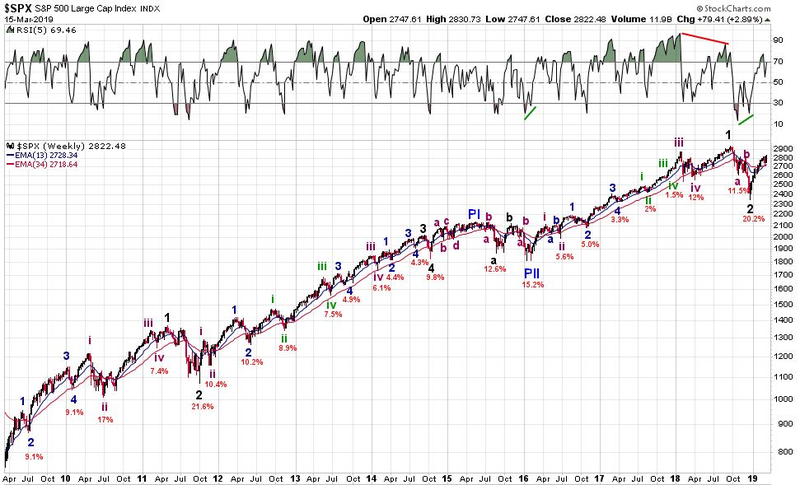 Especially the last hour where the SPX collapsed 20 points and people pulled their bids? The question now is what Barr will allow to be released to the Public. AG Barr does state that the principle conclusions by Robert Mueller may be released as soon as this weekend, to Congress. Seems CNBC was trying to run with that story too (Mueller stuff fodder for the stock market drop), but looks like they gave up on that..
Yield curve inversion doesn’t happen often. Do you have a real unfiltered opinion on yield inversion? Today’s inversion wasn’t the traditional kind of inversion that most people look at between the 10 year and 2 year yield. The inversion was “partial”…. given that it involved the yield on the 3-month bill and not the 2 year. 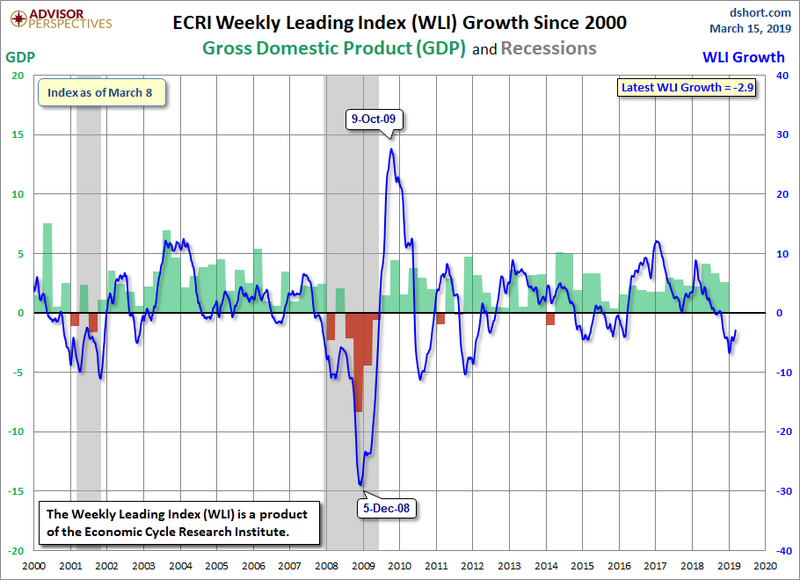 There is usually a fairly long “lead-time” before a Recession actually occurs after an “inversion”. For example, the Recession of 2008 was preceded by an “inversion” (one of several) that initially occurred in late December of 2005…. 2 years before the Recession. I know no one uses the KISS method but the FED announced 3 months ago the economy was slowing. they are unanimous now simply because they “SEE” the results and it is not going to be good. Why else announce ZERO rate hikes? I predicted 2 cuts this year. Housing will be key going forward. No further indictments,NBC says.Was the market selling this report–did they know in advance it was being released today?If so,sell the rumor,buy the fact–especially if no further action against Trump.Let’s see if futes soar Monday. YUP! Not a single TWEET from TRUMP? He is a humble man so i guess he will take his victory lap in silence. Just remember to BUT THE DIPS! And to top it all off, the budget deficit for February was the BIGGEST MONTHLY deficit on record! $234 Billion vs $231.7 Billion from a month earlier. The deficit is +40% higher for the first 5 months of the new fiscal year, compared to last year at this time. Now at $544.2 Billion!